Located just past Patriot Place, The Red Wing Diner is famous for its exquisite fried seafood. Walpole's Red Wing Diner, located just off of Route One, has served as a beloved dining and gathering place for nearly a century. It has the unmistakeable warmth of a restaurant that has fed local families and visitors alike for generations. Step into the Red Wing's bar, a former 1920s era dining car, and you will feel transported back in time. From the original floor to the stained glass windows, the inside of the rustic bar is nearly unchanged from when the restaurant opened in the 1930s. Today, the Red Wing continues its longstanding tradition of serving excellent food to excellent people. It is widely recognized for its delicious seafood, even being featured by New England's Phantom Gourmet. All of our chefs have been specially trained in using the Red Wing's traditional secrets to craft the most delicate, delicious, fluffy, and crispy fried seafood. ALL CHILDREN MEALS COME WITH A SMALL SOFT DRINK AND A SUNDAE DECORATED HOODSIE CUP. Homemade onion rings lightly battered. Served golden brown with our own dipping sauce. Crunchy on the outside, melty on the inside, served with our own marina sauce. Lightly tossed with hot banana peppers and topped with lime aioli accompanied with our own house marinara. 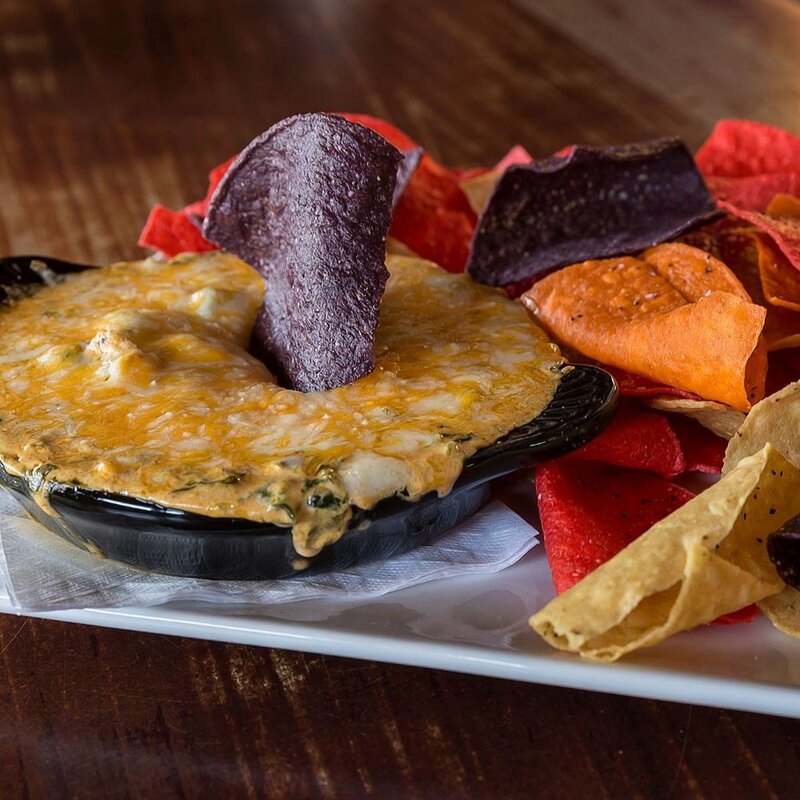 Creamy spinach, Chicken and house made buffalo sauce tossed with crumbled Gorgonzola cheese, and topped with shredded cheddar cheese served with tortilla chips. 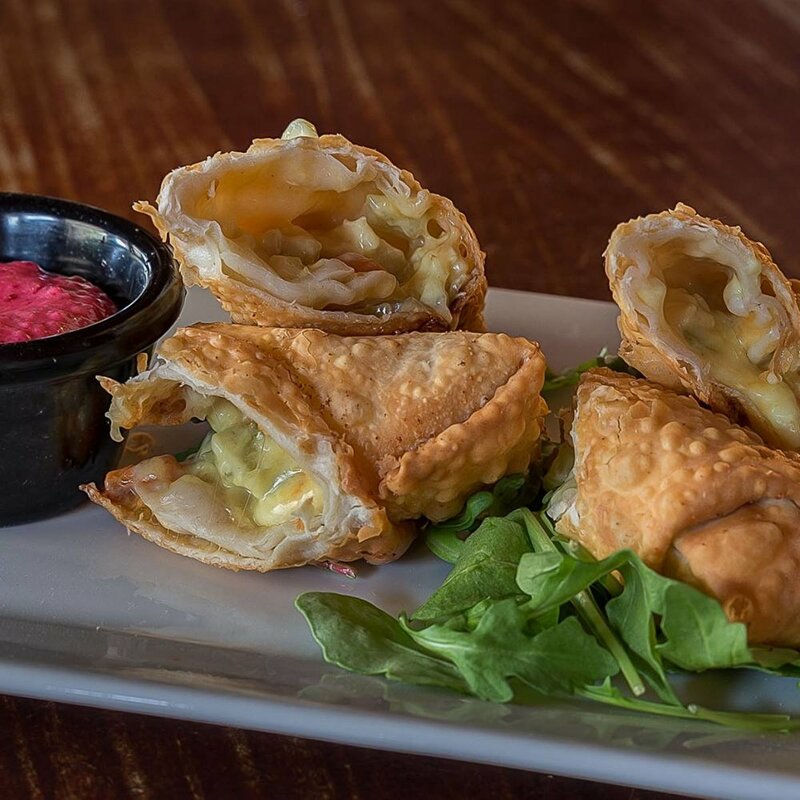 Mother's secret pot pie recipe wrapped in an eggroll served with cranberry mayo. Two clams filled with our signature stuffing and baked until golden brown. 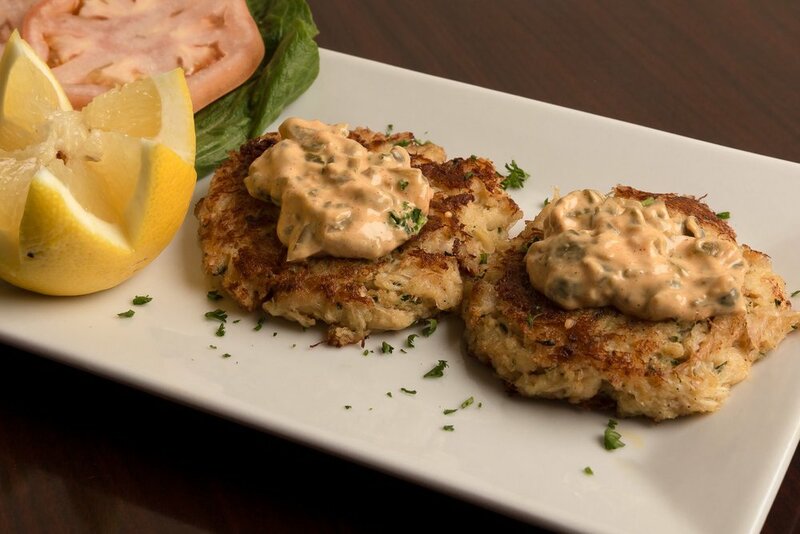 Cooked until perfectly golden brown then finished with our homemade remoulade sauce. Our signature fried dough filled with fresh clams then cooked until perfectly golden brown. Your choice of sauce: Bourbon Maple Bacon, Buffalo, BBQ, Buff-A-Que, Sweet Teriyaki. Served with Bleu Cheese and Celery Sticks. Everyday, our chowder and soups are prepared from scratch right here in our kitchen. Crispy salad mix with tomato, cucumbers, olives, red onions, salami and cheese. Topped off with our famous house italian dressing. A crispy salad mix with tomatoes, cucumbers, olives, red onions, feta cheese topped off with a pepperoncini. Served with a creamy Greek dressing on the side. Fresh mozzarella sliced tomatoes fresh basil touch of garlic over house salad mix and finished with virgin olive oil and balsamic glaze. Cold crispy iceberg lettuce grilled chicken, tomato, cucumbers,red onion, bacon, and crumbled bleu cheese topped with our creamy ranch finished with balsamic glaze. Blackened chicken, house salad mix, hummus, black olive, feta cheese, tomato, and red onion finished with basil oil drizzled served with warm pita bread. Just like Grandma used to make. We roast our own turkey right here, then serve it with all the fixings. Your coice of potato and vegetable, cranberry sauce and of course our homemade stuffing & gravy. Center cut sirloin and shrimp (6) grilled to your liking and finished with dijon bistro mustard sauce, accompanied with mashed potatoes and vegetable. We start with a mound of mashed potato topped with our marinated steak tips cooked to your liking covered with our sweet Jameson Irish Whiskey sauce then top it all off with homemade crispy onion rings. Broiled shrimp served over linguine with diced tomatoes, freshly chipped parsley and garlic butter. Sauteed peppers, onions, and mushrooms in a rich pink Parmesan vodka sauce. Roasted red peppers, spinach, onions, mushrooms, and broccoli all in a creamy pink sauce with your choice of pasta. Grilled to your liking, Served with your choice of potato and vegetable. Fresh haddock fillet cooked to perfection and topped with spinach and melted mozzarella cheese served with potato and vegetable. Our classic cheese burger comes with lettuce, tomato, red onions, and accompanied with a side of mayonnaise. Served on a brioche roll. No veggies on this burger, just creamy ranch, bacon and of course, cheese. Served on a brioche roll. Topped with Swiss cheese, sauteed mushrooms and onions. Served on a brioche roll. Our signature half pound burger on a thick marble rye with Swiss cheese corned beef and tangy mustard. Served on a brioche roll. Classic veggie burger topped with caramelized onions and melted crumbled bleu cheese. Served on a brioche roll. Served on white or wheat with smoked bacon, lettuce, tomato, and mayo. Grilled chicken topped with sliced ham and melted Swiss cheese then finished with honey and mustard served on a brioche roll. Shaved steak tossed with mushroom and onions topped with American cheese served on torpedo roll. Shaved corned beef, Swiss cheese, sauerkraut, and thousand island dressing served on thick marble rye. Served on burger bun lump crab meat with lettuce and tomato finished with remoulade sauce. 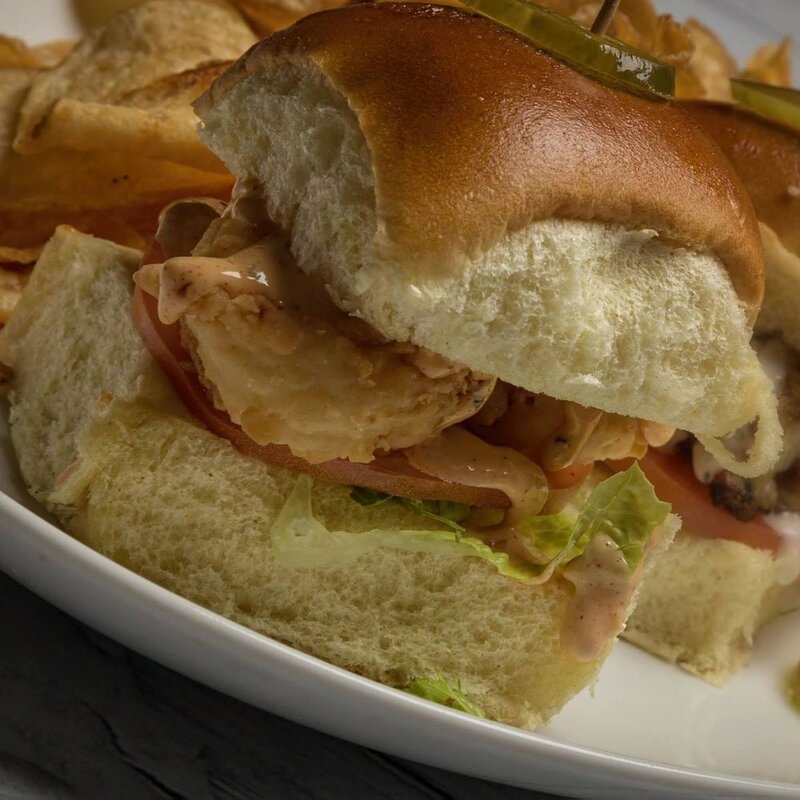 Cajun shrimp, lettuce, tomato, red onion, served ona torpedo roll with chipotle mayo. Pan seared Cajun style shrimp with spinach, tomato, and red onion finished with lime aioli sauce in a tortilla wrap. An all time Red Wing favorite. Lobster ona bed of lettuce ina toasted roll, mayonnaise on the side. Served with French fries. Fresh haddock cooked until golden brown and served on three soft taco shells then topped with our house made cole slaw, lettuce, and diced tomato, finished off with lime aioli mayo. 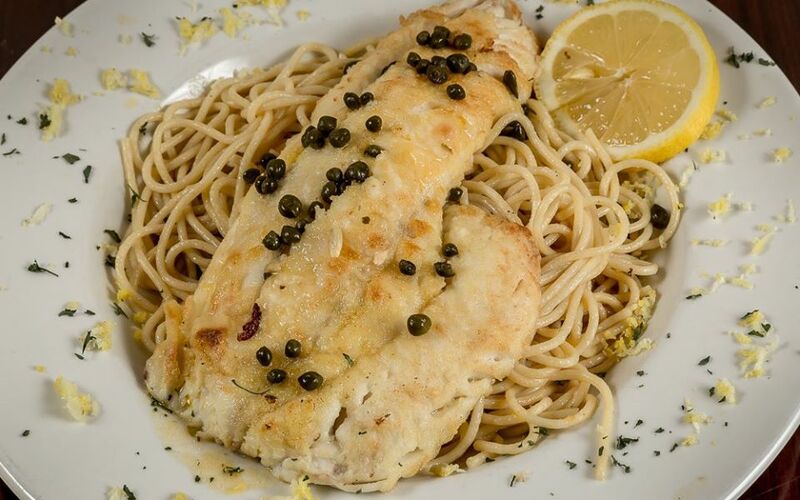 Our seafood is broiled in water, white wine and just a touch of butter and topped with bread crumbs. Served with your choice of potato or vegetable. This one's a head turner. Made for two people or one really big appetite. (Whole belly clams or clam strips), sea scallops, shrimp, haddock, french fries, cole slaw and onion rings. The Red Wing has been serving our famous fried seafood for well over 50 years. Served with French fries and coleslaw. Fried clam strips gently cradled in a grilled hot dog bun served with your choice of crispy french fries or homemade delicious cole slaw. With a choice of two of the following: Whole Belly Clams, Fried Scallop, Fried Haddock, or Fried Shrimp. With a choice of one of the following: Fried Scallops, Fried Haddock, or Fried Shrimp. FOR WELL OVER FIFTY YEARS THE RED WING HAS BEEN SERVING PIZZA. EVERYDAY WE START BY MAKING OUR DOUGH BY HAND RIGHT HERE IN OUR OWN KITCHEN. WE MAKE OUR OWN SAUCE AND EVEN GRIND CHEESE EVERYDAY SO WE CAN SERVE OUR CUSTOMERS THE FRESHEST HOMEMADE PIZZA POSSIBLE. Diced Peppers and onions, sliced mushrooms and fresh sliced salami. Diced tomatoes, diced onions, garlic and bacon. Sliced Pepperoni, fresh sliced mushroom, and sliced banana pepper. Italian Sausage, pepperoni, ground hamburger, and ground linguica. Fresh grilled chicken tossed in buffalo sauce melted cheddar shredded cheese and crumbled bleu cheese. Fresh chopped broccoli, roasted peppers, onions, and black olives. Smoked bacon, tomatoes, roasted red peppers, BBQ sauce, and fried onion rings. Creamy chicken Alfredo sauce, roasted red pepper. Diced tomato, fresh basil, cheddar, and mozzarella cheese. Certified Angus sirloin cooked to your liking then topped with peppers, onions, mushrooms with melted American cheese served on a sub roll accompanied by a side of French Fries. Fresh Haddock cooked with sherry wine and lemon butter. Then topped with tomatoes, onions and green peppers. Garnished with light bread crumbs. Accompanied by a side of garlic mashed potatoes and the vegetable of the day. Grilled chicken with bacon, mushrooms and peas tossed in a rich cream sauce rested over fettuccini pasta. Elbow pasta baked in a rich creamy cheese sauce. Finished of with toasted bread crumbs and your choice of a fried chicken tender or shrimp. Garnished with scallions. Fresh chicken breast coated with Chef Lucas' seasoned bread crumbs. Then pan fried until perfectly golden brown. Accompanied by a side of garlic mashed potatoes and the vegetable of the day. The Red Wing Diner's management staff would be pleased to answer any questions as well as kindly accept any critiques of our establishment.